The camera at the end of the robotic arm on NASA's Mars rover Curiosity has its own calibration target, a smartphone-size plaque that looks like an eye chart supplemented with color chips and an attached penny. When Curiosity lands on Mars in August, researchers will use this calibration target to test performance of the rover's Mars Hand Lens Imager, or MAHLI. 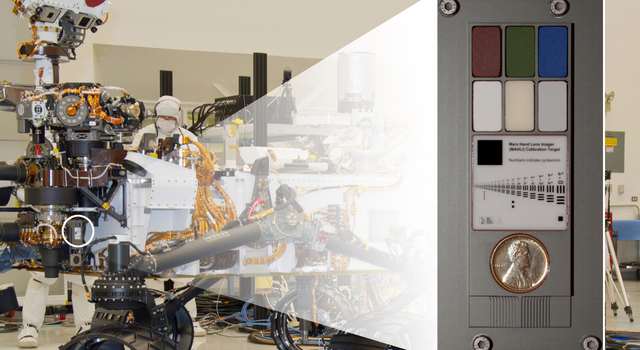 MAHLI's close-up inspections of Martian rocks and soil will show details so tiny, the calibration target includes reference lines finer than a human hair. This camera is not limited to close-ups, though. It can focus on any target from about a finger's-width away to the horizon. Curiosity, the rover of NASA's Mars Science Laboratory mission, also carries four other science cameras and a dozen black-and-white engineering cameras, plus other research instruments. The spacecraft, launched Nov. 26, 2011, will deliver Curiosity to a landing site inside Mars' Gale Crater in August to begin a two-year investigation of whether that area has ever offered an environment favorable for microbial life. The "hand lens" in MAHLI's name refers to field geologists' practice of carrying a hand lens for close inspection of rocks they find. When shooting photos in the field, geologists use various calibration methods. "When a geologist takes pictures of rock outcrops she is studying, she wants an object of known scale in the photographs," said MAHLI Principal Investigator Ken Edgett, of Malin Space Science Systems, San Diego. "If it is a whole cliff face, she'll ask a person to stand in the shot. If it is a view from a meter or so away, she might use a rock hammer. If it is a close-up, as the MAHLI can take, she might pull something small out of her pocket. Like a penny." Edgett bought the special penny that's aboard Curiosity with funds from his own pocket. 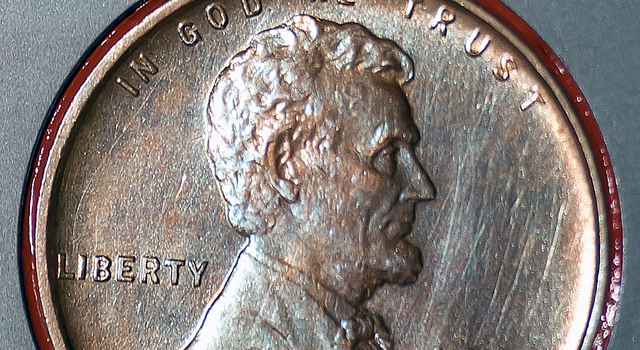 It is a 1909 "VDB" cent, from the first year Lincoln pennies were minted, the centennial of Abraham Lincoln's birth, with the VDB initials of the coin's designer - Victor David Brenner -- on the reverse. 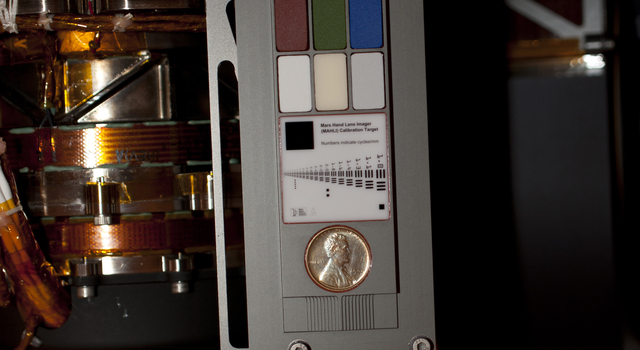 "The penny is on the MAHLI calibration target as a tip of the hat to geologists' informal practice of placing a coin or other object of known scale in their photographs. A more formal practice is to use an object with scale marked in millimeters, centimeters or meters," Edgett said. "Of course, this penny can't be moved around and placed in MAHLI images; it stays affixed to the rover." The middle of the target offers a marked scale of black bars in a range of labeled sizes. While the scale will not appear in photos MAHLI takes of Martian rocks, knowing the distance from the camera to a rock target will allow scientists to correlate calibration images to each investigation image. 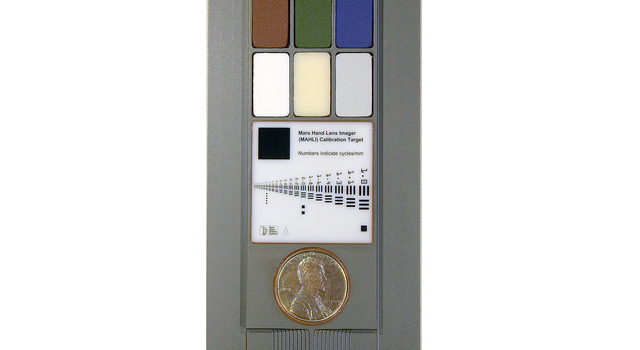 Another part of MAHLI's calibration target displays six patches of pigmented silicone as aids for interpreting color and brightness in images. Five of them -- red, green, blue, 40-percent gray and 60-percent gray -- are spares from targets on NASA Mars rovers Spirit and Opportunity. 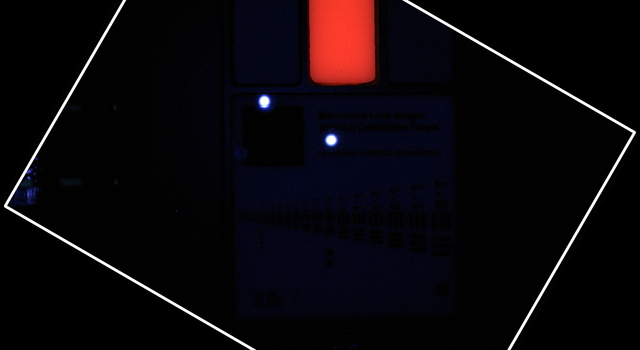 The sixth, with a fluorescent pigment that glows red when exposed to ultraviolet light, allows checking of an ultraviolet light source on MAHLI. The fluorescent material was donated to the MAHLI team by Spectra Systems, Inc., Providence, R.I.
A stair-stepped area at the bottom of the target, plus the penny, help with three-dimensional calibration using known surface shapes. Curiosity also carries calibration materials for other science instruments on the rover. "The importance of calibration is to allow data acquired on Mars to be compared reliably to data acquired on Earth," said Mars Science Laboratory Project Scientist John Grotzinger, of the California Institute of Technology, Pasadena. 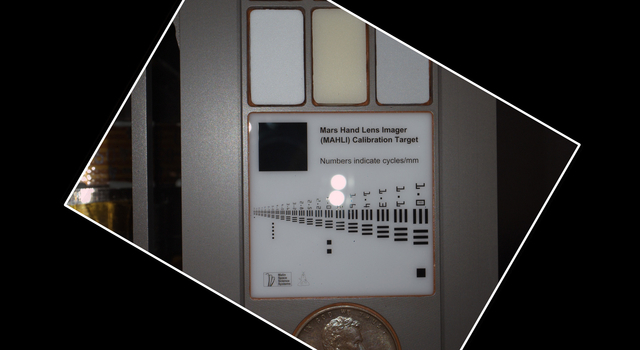 The MAHLI calibration target, with its penny and a miniscule cartoon of a character named "Joe the Martian," serves an additional function: public engagement. "Everyone in the United States can recognize the penny and immediately know how big it is, and can compare that with the rover hardware and Mars materials in the same image," Edgett said. "The public can watch for changes in the penny over the long term on Mars. Will it change color? Will it corrode? Will it get pitted by windblown sand?" The Joe the Martian character appeared regularly in a children's science periodical, "Red Planet Connection," when Edgett directed the Mars outreach program at Arizona State University, Tempe, in the 1990s. Joe was created earlier, as part of Edgett's schoolwork when he was 9 years old and NASA's Mars Viking missions, launched in 1975, were inspiring him to dream of becoming a Mars researcher. Edgett said, "The Joe the Martian on Curiosity really is a 'thank you' from the MAHLI team to the folks who have provided us with the opportunity to study Mars, the U.S. taxpayers. He is also there to encourage children around the world to set goals that will help them achieve their dreams in whatever interests they pursue." 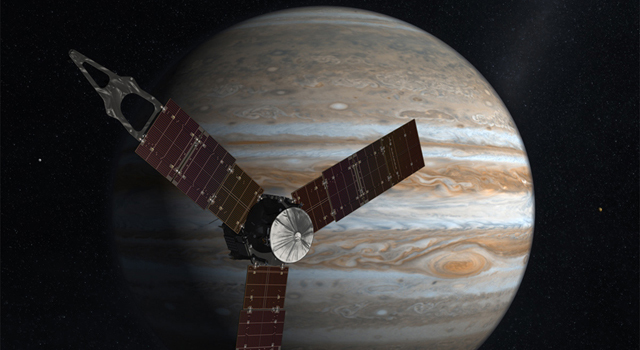 The Mars Science Laboratory is managed by NASA's Jet Propulsion Laboratory, a division of the Caltech. 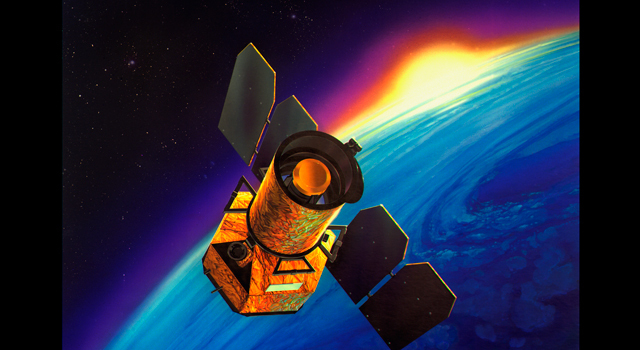 For more information, visit http://www.nasa.gov/msl .